Since I have become a stay at home mom, I believe I sleep even less than when I worked. This is because I have about a billion things that I want to accomplish. Unfortunately, as with knitting projects, I tend to be fairly monogamous in life projects. So I haven’t been focusing on knitting like I would like to and I haven’t been spinning at all lately. I have gotten a start on some of the designs that I want to complete, but last week I had a booth with Thirty-One to work at an event so I spent most of the week preparing for that. Now that the event is over and I am finally able to settle back into my routine a bit, I can focus back on my passion a little more. My husband has to be out of town for his job tonight and had to leave super early this morning so I was limited in what I could do without waking him. I ended up laying in bed with the earbuds in watching a few YouTube videos from Knitpicks on finishing a sweater and I think I finally decided that I want to do an attached icord edge on my sweater. I think. I also really like the picot edging that they show in the same series, but I’m not sure how I would do that with the v neck so if I can’t figure it out, then I will be going with the attached icord. Watching the KP videos has made me really want to do a nice sweater with color work but because it is finally starting to act like spring here in NW Arkansas, I think I will stick to my Queen Anne’s Lace shawl for now. I really love the pattern. It is both beautiful and fun to knit. I wish I could take an in progress picture but it looks like a big blob because I can’t spread it out on the needles enough. Soon enough it will be finished and I will be able to take lots of pictures of it. As much as I love the pattern for the Queen Anne’s Lace, I have decided that I need to do some of my own designs. I really want to do a book or 30 of my own designs. I have a ton of ideas in my head and I want to do something with them. Even if I never publish them, I want to make them. I have never done anything like this before so it is all new to me. I am really excited to do it and if anyone has any tips or tricks, all advice is welcome! I had fully intended on getting this out there a few days ago, but I ended up with a sick baby and that pretty much means that my time on the computer was limited for several days. He is much better now, thankfully and I can get back to blogging. The back of my Sidelines Sweater is complete. It was a quick knit for me. Other than some shaping it is stockinette stitch, except for the princess lines which are reverse stockinette. I completed the bulk of it while watching the last Harry Potter movie. I just have it kind of pinned out on the floor. Because it has no edging, it rolls terribly at the edges. Once it is seamed and the bottom edging is done, that will change. Here is a picture of the back. The front? Well progress has slowed down considerably on the front. I cast on the front immediately and got past the first 3 or so cables when I realized that I was twisting the wrong direction on the left (or would it be right side) cable so I dropped back down just on the cables and fixed them. 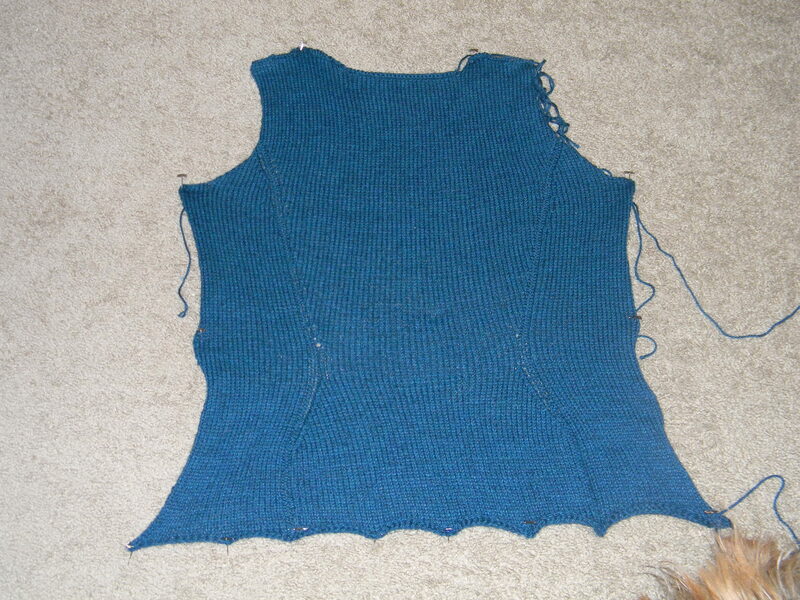 About 40 rows later I realized that I somehow forgot to decrease on the 20 rows worth of decreasing. I tried just pulling out 19 rows and tinking back row 20 but once I got that done, I couldn’t really figure out what I had done wrong so I decided to just rip back the entire front. I was much happier with the end result. Then came the V neck. I don’t know what I did wrong. I really haven’t taken the time and effort to look and see what going on with it. It frustrated me so right now Sidelines is in time out. I really love the look of this pattern. I don’t care as much for the pattern itself. I know that I am just one person and this is purely my opinion, but I feel as though the pattern is a bit confusing. It very well could be just the way that the pattern was published. There are several long sections of “at the same time” and it isn’t very plain to me. I feel as if it could have been written more clearly. It may just be that I need things spelled out. Any way I feel that maybe a chart would have been a little better at least in addition to the written directions. I think that if I were to knit this pattern again, I would likely do it in the round, and/or do my own chart for the pattern. Part of my problem may be that I have too many distractions right now to knit something with that much going on at once. Well I haven’t had a whole lot of spare time to blog lately. I suppose that is what happens when you have a 9 month old who won’t sit still for 2 seconds. I have gotten quite a bit of knitting done lately though, at least considering I have a full time job and have a sweet baby boy. I have no finished objects to show for my knitting, but I hope to have some soon. I’ll get to that in a bit. First a recap of my weekend. I got to spend the weekend in the Tulsa area with two wonderful ladies. My best friend Jessica and our dear knitting buddy Cassie. Bethany was supposed to join the group as well, but she was sick so we missed out on her company. After a slow start (My alarm didn’t go off) we made our way to Kellyville, OK to the Fiber Christmas in July. This was my first event of this size and I had a blast. We started out at fiber festival and made a big loop around just window shopping then we headed over to Loops South for some more shopping. We each made some purchases at Loops, I believe each of us a sweaters worth of yarn, and then headed back to Kellyville to make fiber purchases. I have to say that we did so well. We decided ahead of time what it was that we wanted to buy and didn’t really need to buy. We made a full loop around the festival before making any purchases (well except for Cassie, but in her defense we were almost all the way around and it was a deal that was too awesome to pass up) and really stuck with what we needed rather than going totally crazy buying everything we petted. I wish I could have bought more, but I am so thankful for what I did get to buy. I will post pictures later, but I bought 16 oz of BFL, 8 oz of polwarth, 1 gorgeous batt and a bit of sparkles by Dawning Dreams, and 2 oz of charcoal bamboo/sparkle thanks to Cassie. Not a bad day if you ask me. So after all of the fibery goodness, we grabbed a bite to eat and headed back to the hotel to get comfy and knit for the evening. We went downstairs and hung out in some big comfy chairs and knitted while watching the Olympics and Ghost. Perfect kind of evening. Oh and we taught a little girl how to knit. She walked by from the pool and told her mom that she had been wanting to learn. We told her to come on and learn and they came back with yarn and crochet hooks. Well we improvised on some needles for her and taught her and her mom to knit. Both picked it up pretty fast. I hope they keep it up. Sunday we knitted a bit after breakfast, went to see What to Expect, and then headed to the Cheesecake Factory for lunch. Oddly we didn’t eat any cheesecake. A quick stop in at Babies R Us and Jo-Anns and we headed home. After a weekend like that, I have to say I have some of the greatest friends ever. Some days I feel so lonely but then I look and see the wonderful ladies that are in my life and I am so thankful for them. While on the trip I had a goal of finishing chart one of the Queen Anne’s Lace shawl and I actually achieved this goal! Let me back up. I had some issues with the shawl before and since I was too good for a lifeline, or so I apparently thought, I ended up ripping the entire thing out and restarted it a little over a week ago, I think it was. I have mostly been knitting on it during breaks at work, but the first chart is now done! I have been running lifelines every couple of rows because I am playing it safe this time around! My treat for being so good and actually finishing the first chart was to cast on the Sidelines Top from the Fall 2008 Interweave Knits magazine. I originally bought the yarn to knit the Dahlia sweater, but when I was looking for my pattern, I came across Sidelines and realized that was what this yarn was meant to be. I have about 2.5 inches of the back knitted so far. I am excited. I will post pictures of all my loot and maybe some in progress shots in a couple of days. I am so sleepy so I guess it is bedtime!